Walking his two young children to school every morning, Thad Carhart passes an unassuming little storefront in his Paris neighborhood. Intrigued by its simple sign--Desforges Pianos--he enters, only to have his way barred by the shop's imperious owner. Unable to stifle his curiosity, he finally lands the proper introduction, and a world previously hidden is brought into view. Luc, the atelier's master, proves an indispensable guide to the history and art of the piano. Intertwined with the story of a musical friendship are reflections on how pianos work, their glorious history, and stories of the people who care for them, from amateur pianists to the craftsmen who make the mechanism sing. 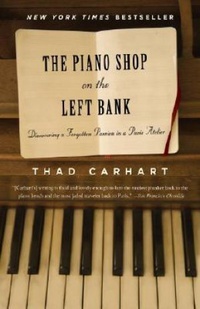 The Piano Shop on the Left Bank is at once a beguiling portrait of a Paris not found on any map and a tender account of the awakening of a lost childhood passion.